We are welcome all our guests to enjoy staying with wonderful scenery of nature and delicious meals with lots of uses local fresh ingredients !! 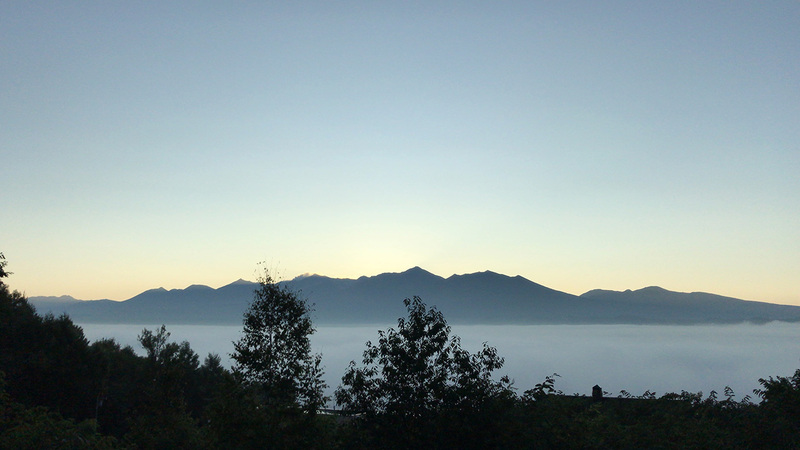 From Pension Yamasan there is a vast rural landscape and the "roof of Hokkaido" the Tokachidake mountain range, the sunrise rising from the Tokachidake mountain range when the weather is good and the sea of clouds spread before the weather conditions match. 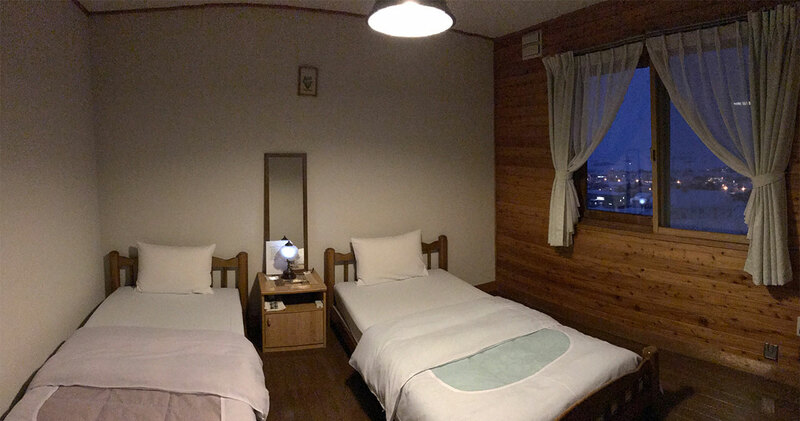 In the summer you can also enjoy the sightseeing plans of "All you can eat Furano Melon" and "Harvest experience of corn and mini tomato" at Hokusai Farm of Pension Yamasan group farm. 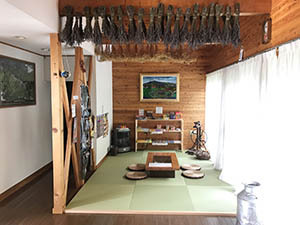 The surroundings of Pension Yamasan are enriched with forests and early morning walking courses while watching small birds and small birds so please try by all means. 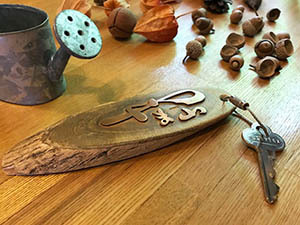 You can harvest wild vegetables and mushrooms throughout the four seasons. There are many shooting points that nobody knows, We think that everyone will be pleased. 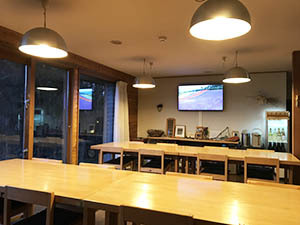 Summer season accomodation in 2019 is scheduled to open from 14th/June to 16th/September. lodge accomodation may not be allowed under 6 years old. Child accommodation fee and food are the same as adults. Please be informed we are not able to change the menu of each meals. Please inform us if you are allergy with any food or ingredients when you make reservation. Child accommodation fee are the same as adults. Please select a payment method according to online reservation. For e-mail Contact Us, please click here. We will inform you by e-mail (PayPal) after reservation. We will inform you by e-mail (Paypal) 30 days before your Accommodation day. We will inform you by e-mail (Paypal) 100% of the accommodation fee. Please make payment with credit card from PayPal within within the due date. Why better to use Paypal system? Please create your own Paypal account for your payment security. If you can not make a payment even after the settlement deadline, we will cancel your reservation. From reservation confirmation until 31 days before the staying date. - 20% of the accommodation fee. From 30 days to 15 days before arrival. - 50% of the accommodation fee. From 14 days before the day until the day. - 100% of the accommodation fee. 3 minutes by car to JR Nakafurano Station. But there is no pickup after 17:30 p.m. Please come by taxi after 17:30 p.m.
Dinner will be served from 19:00 please prepare in advance & attend on time to enjoy meal. Please contact us if you want to check in early. Check out -　-- 10:00 a.m. Parking -　A capacity of 7. Please enjoy our selection of fresh seasonable vegetables from Hokusei Farm and main ingredients from Hokkaido. Ingredients may be change according to the season. 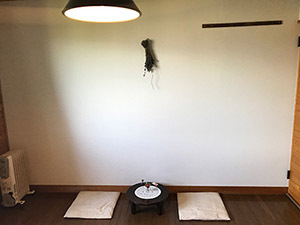 Only for consecutive nights guests: The second evening meal will be sukiyaki or Dutch oven cooking. We will consult the contents of the meal from the third night. 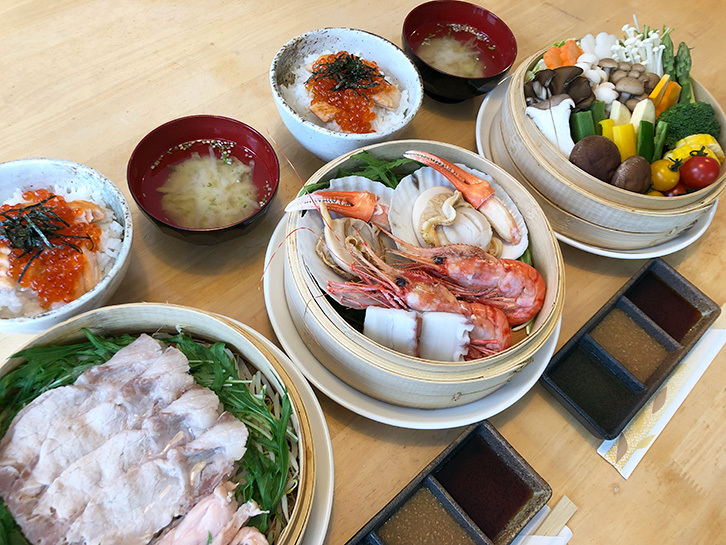 Enjoy this delicious barbecue and creating a memories of vacation in Furano! Please wear a long pants when you attending barbecue. Please kindly inform us if you have any allergy with foods. The breakfast is American style or Japanese style. Please be informed all guest rooms does not own private bathroom and toilet. Toilet: Two toilet Male/Female separately inside the pension. Bath towels, face towels, bath gels, shampoo, rince, hair dryer, slippers. We will have a wonderful view of Tokachidake mountain and a delicious cuisine based around Hokkaido's ingredients. In the summer there are many flower gardens, including Farm Tomita(ファーム富田), Shikisai no Oka(四季彩の丘), Miyama Pass Lavender Garden(深山峠ラベンダー園), Flower Land Kamifurano(フラワーランドかみふらの), Sunrise Park(日の出公園), Municipal Lavender Garden(町営ラベンダー園), Saika no Sato(彩香の里) and many other flower gardens, not only lavender but also a wide variety of flowers From blooming, From Biei-cho to Kamifurano Town, Nakafurano Town, Furano City along National Route 237 alongside the "Flower People Road"(花人街道) is popularly nicknamed, We are crowded with people who watch various landscapes and gorgeous Hokkaido garden tour. 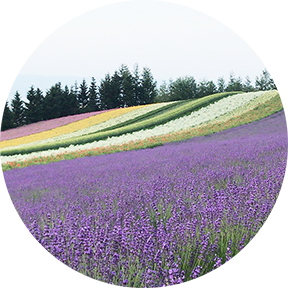 Furano and Biei is very famous sightseeing areas in Hokkaido. Movies and drama was shooting at this beautiful area in the past. Experience cheese making with local fresh milk and fresh cream, and various workshops and cafes that handcraft original works, Enjoy the fantastic sight of illumination and the flow of romantic time, Enjoy activities, experience beautiful glass production, experience jam making, You can relax and shop at restaurants and cafés where you can taste warm and delicious meals and an elegant coffee time. Refresh your body and mind open to the magnificence and silence of nature! 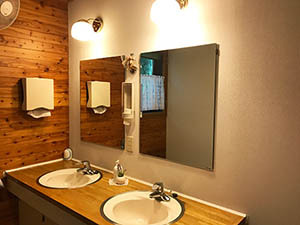 There are more than 10 natural hot spring facilities including Tokachidake mountain hot springs and Fukiage hot springs located on the middle of Tokachikado mountain ranges, and Shirogane Onsen located on Middle of Tokachidake mountain, Good quality spring water is said to have various effectiveness. 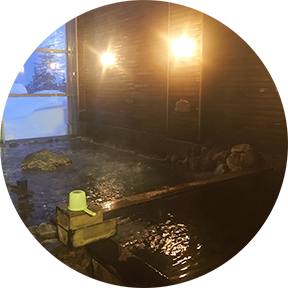 From the outdoor bath you can also enjoy the magnificent panorama of Fukano Temple and the Furano Basin, and in the sky you can enjoy a charming hot spring that relaxes comfortably while looking at the sky full of stars at night. 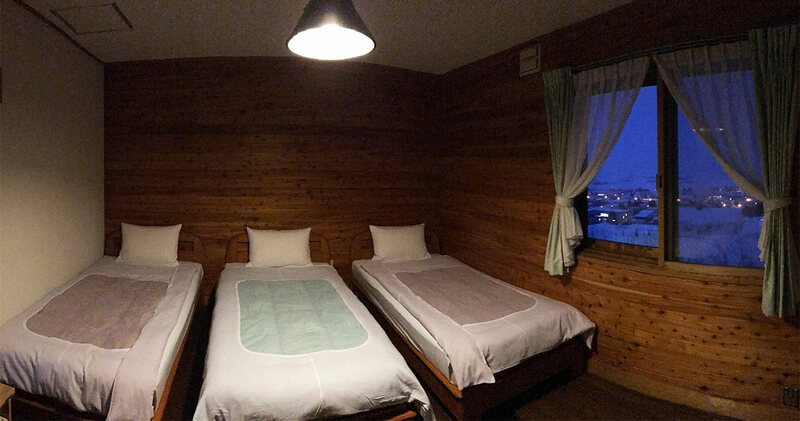 It is also attractive that the spring quality differs for each and it is also recommended to visit hot springs in Tokachidake mountain. We are not acceptable any reservation and inquiries by telephone. please search by our phone number (0167442337). 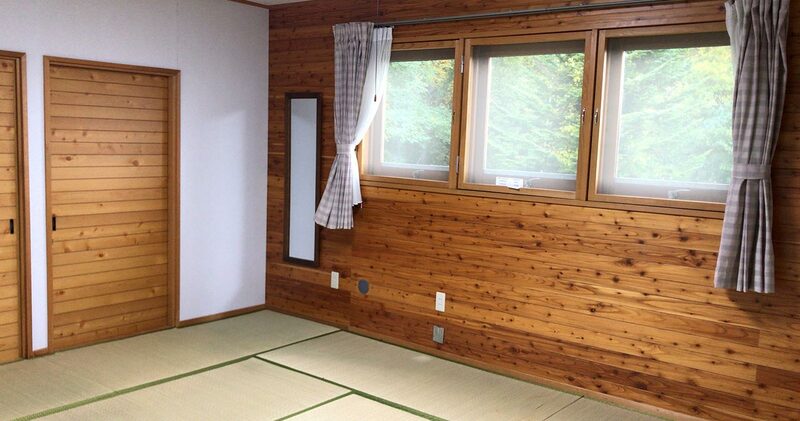 About 13 minutes walk from Nakafurano station. About 3 minutes car from Nakafurano station. Drive 3km direction to Nakafurano. You will immediately see the "LODGE YAMASAN"
Furano Melon all-you-can-eat & harvesting sweet corn and mini tomato. 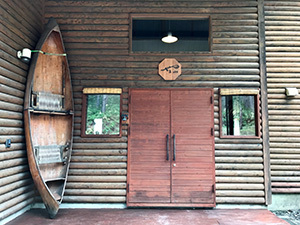 Café near bottom of Prince Snow Resort will be our meeting place for backcountry lessons. 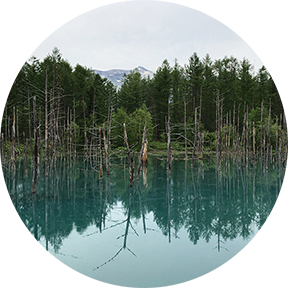 (Kitanomine, Furano-city.) This café is the general information center of such winter sport, real estate, accommodation, shops.